Why put your camera in any old, bland, run-of-the-mill case, when you could put it in one of many cute camera cases from Fabrix®? Like the adorable Black Flora case or the very cute black & white polka-dots case, 2 of my personal faves. Besides these, they have several other fabrics to chose from, plus, they make iPod sleeves as well. 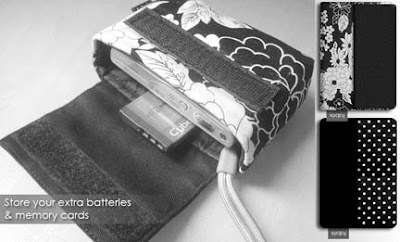 So, dress up your gadgets in style!